Repeat after me: This is not as bad as giving your baby a fast-food name for cash. This is not as bad as giving your baby a fast-food name for cash. This is not as bad as giving your baby a fast-food name for cash. Okay. Now we’re in the right mindset. 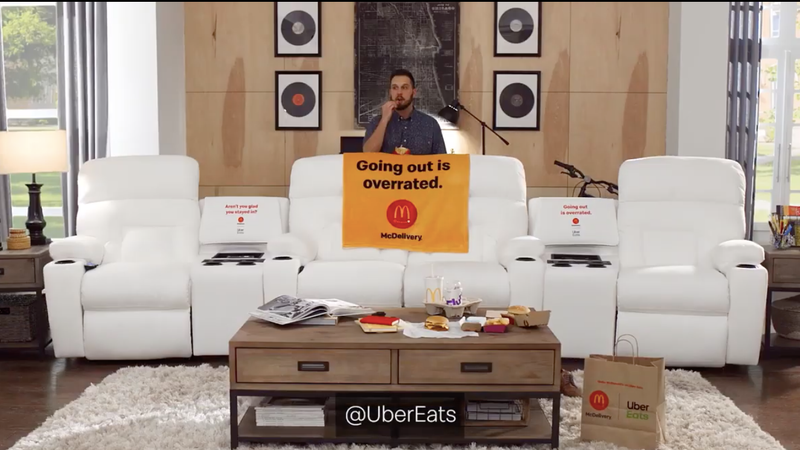 So: In a move that is not as bad as asking parents to sell out their kids at birth, McDonald’s has partnered with La-Z-Boy to make the McDelivery Couch, a furniture monstrosity “designed to optimize every part of the McDelivery with Uber Eats experience.” The stated reason is that “spring TV is back”—that’s fair, as a person who writes about TV I can verify that this time of year is nuts—and more specifically, that the NCAA tournament has arrived. It’s just a free couch, it’s probably pretty comfortable, and it has a bunch of bells and whistles. So acknowledged. But woof. It’s also the shape of an upholstered semi-trailer. Our philosophy here is “don’t yuck on anybody’s yum,” but that couch is not edible, so, yuck yuck yuck. “McFlurry chillers,” which are just coolers built into those giant consoles chilled to 33 degrees Fahrenheit. Light up cup holders. Festive! Here’s one that actually makes a lot of sense: The couch is upholstered with stain-resistant fabric. So, go ahead and throw your ketchup all over the place. Anyway, if you really, truly want this thing, tweet “your favorite McDelivery item,” using #McDeliverySweepstakes and tagging @UberEats and @McDonalds, by April 8. You can enter once a day. More power to you. Let us know how you choose to cover up those logos.